Original tutorial posted 4/3/03 on the PoserPros forums. Re-posted here with permission from Will Dupre. A short while ago Daz gave me the great opportunity to test out their new Anna Marie Digital Clone character for V3. While they are still fine tuning her for release they graciously allowed me to show off my work with this great new character. I took this opportunity to learn some more digital postwork techniques. Cris Palomino was a spectacular coach who helped me do a fairly successful job of creating long hair for the piece in painter. But that?s not what this thread is about. What this is about is creating clothing in a different way in postwork. Many of you might know that Jasc has released a public beta of their flagship Paint Shop Pro program (which I have been a long time fan of). I have started to use this beta and I?ve got to say I?m blown away by all the new and improved capabilities. One of which is the subject of this thread (bet you never thought I was going to get to that.) the tool is called Mesh warp and it is an amazing tool indeed. So I was working on this image which I call Flirt! And I had a definite idea of what I wanted to do with it, learn how to paint hair for one, but also I had this idea of how to use Mesh warp, (which I?d been experimenting with) to create patterned clothing which would be very time consuming to paint and has more folds then would be easily done with conforming clothing. The result is the image below. The first step after painting the hair and some preliminary postwork is to create the cloth I want to warp around my figure. I want a lace pattern, which will show the skin underneath. I start with a lace pattern, which I tile to a large enough size to work with in the scale I want for the flattest part of my finished dress. 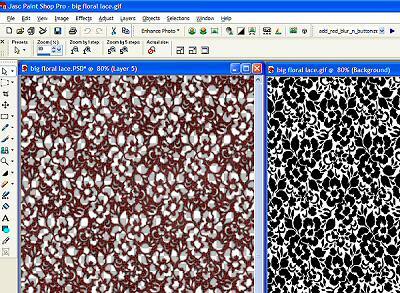 Increase the contrast and turn to black and white for easy selection of the pattern with the magic wand tool. I create a new layer and turn the image into a PSP or PSD (for compatibility with Photoshop or Painter) file. I then get rid of the background and use my selection. To paint the texture and create the open lace I used a little gausian blur and a few other tricks to make the texture I wanted. Obviously if you are using a patterned cloth as is you don’t have to go through all these steps. The next step is to copy my cloth layer and paste it as a new layer in my working image. Making sure that that layer is still selected you want to open your mesh warp tool. Which you can find stacked under your deform tool. 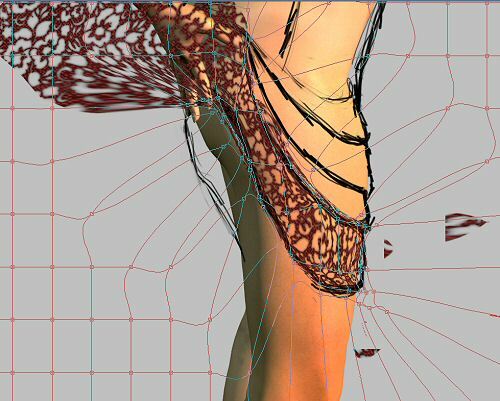 (1) At this point you can decide how tight you want your warp mesh to be. (2) You don’t want it too small because the tighter the mesh you have the more points you have to adjust. Make it just small enough to give you enough detail to work with. Next the fun stuff, we start warping. By pulling the points around to create the proper distortion of the fabric for the perspective of the body. Oh I almost forgot it would be a good idea to make a sketch of the clothes you are going for to keep track of your plains as you warp. You can put that sketch on a layer above your fabric layer if the fabric is opaque or below, if as mine is the fabric is translucent. Remember the warp only affects the selected layer. Because I’m doing multiple folds, which will overlap, I am doing a different layer for each fold, which will overlap slightly. Notice I am not concerning myself with anything that is not part of the bodice area itself at this point because I will erase everything that I don’t need. This image is about mid adjustment. You want to work it fairly slowly and carefully and keep remembering your figure anatomy and perspective at all times. Think of keeping your mesh square with the perspective of the area in question. It should look like they are regular squares going back in perspective depending on the angle of the surface plain. Here’s the first fold. I’ve turned off the bodice section so I can see this layer clearer while I am working. And here’s the last front fold. You can see here how I started erasing the unneeded cloth. After creating all the fold layers I went back and did this to each layer. After this layer I also created a layer behind the figure for a small section behind her bottom where the skirt peaks out. You can see that in the final image. I also went in and painted some seams along the top and bottom of the dress and put in some shadows on the surface. When the dress was done I flattened the layers on top of the figure and created a shadow layer by copying the dress to a layer beneath. Darkening and adding blur, then shifting the layer a bit.